Use of BlackBerry OS 6.0 is up slightly from last month to 25.9% of all users. The growth of users at OS 5.0 or higher saw slightly larger gains, and is now up to 85.8% of all BlackBerry users. 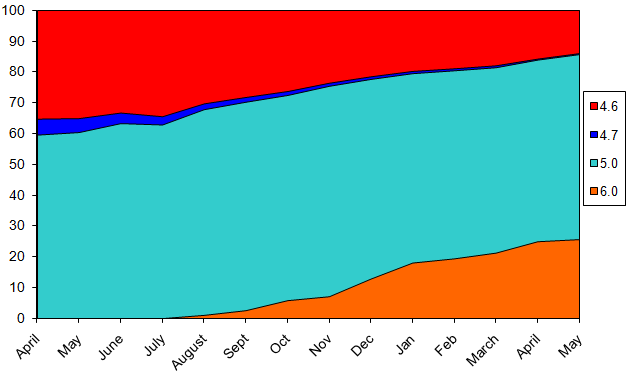 There were also some users of OS 7 in the logs, although those were left out of this chart. Besides the 9900/9930 there are also indications of devices in the Torch and Curve families running OS 7 (which is in line with leaks that have come out). As usual this data is taken from downloads of the popular BlackBerry strategy game Pixelated. Data starts from the release of version 2.0 in April of 2010, and goes through the end of last month.